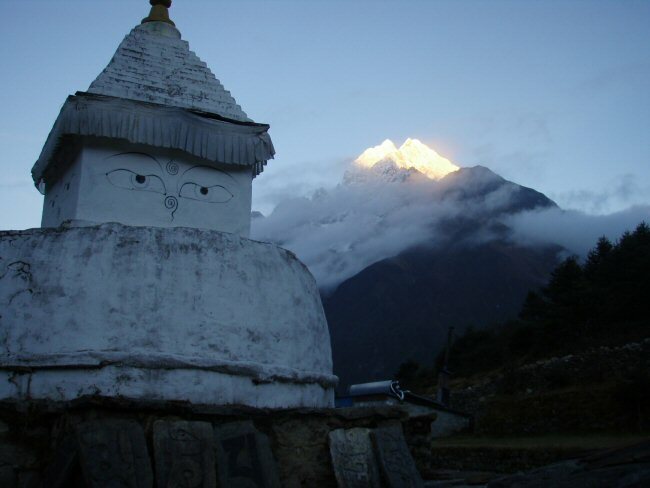 We will be staying at Namche another night, to adjust to the altitude, but have a chance to explore around Namche and above. On the map Namche looks pretty flat: as flat as anything in the whole area. In reality it is anything but: the village itself is arrayed on a slope, and the main trail climbs a couple hundred feet from the bottom of the village to the top (where we are staying). 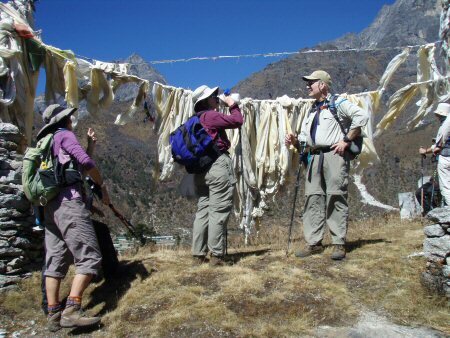 As we were passing through town on our way to camp yesterday, the variety of hiking gear and clothing was stunning. 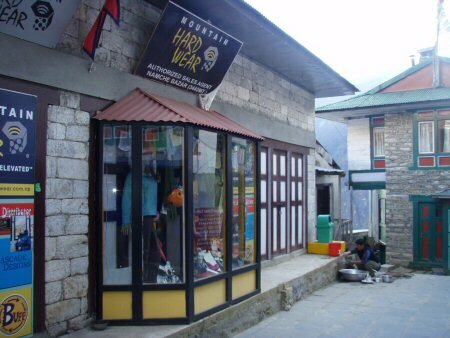 There was a Mountain Hard Wear store, a Patagonia outlet, and a Sherpa Gear store, all within blocks of each other. 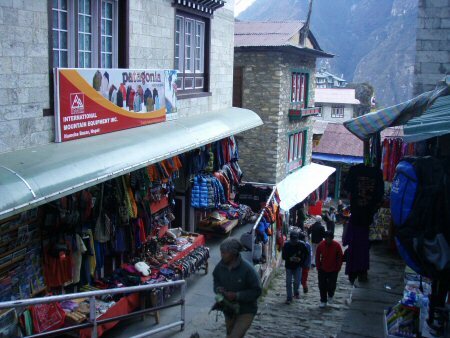 And all up and down the streets there are smaller stores selling every brand of clothing and gear imaginable. A few members of our own group went into town and bought serious expedition-weight down parkas, down pants, and booties. I am beginning to suspect that maybe I should have brought my heaver winter parka, but I am not going to splurge on a piece of equipment I already have (at home). Today's outing takes us from camp, straight up the ridge to Syangboche and a small airstrip, and then up again to the meadows above. 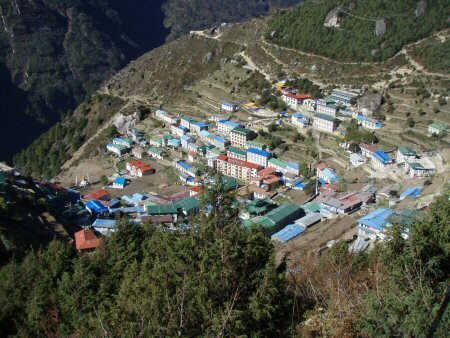 The Everest View Hotel is located above the airport, as are Khumjung (with its school) and Kunde (with its hospital). 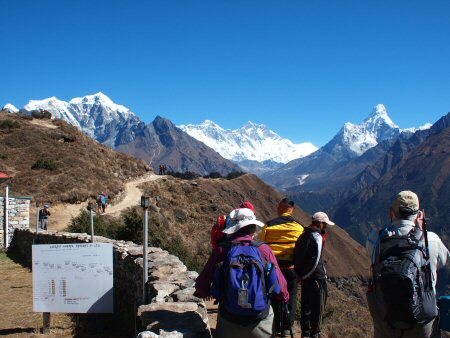 The views from the meadows above Syangboche are spectacular: snowy mountains tower high above in all directions. We explore around, seeing real yaks for the first time on a yak breeding facility. It was marvelous to be out in the sun where it was relatively warm. We circled around, finally descending steeply back to camp. After lunch I walked back into town, visited some of the shops, and got my iPod batteries charged. I picked up a souvenir: a yak bell. It looks like it has been used for years, but the seller claims it is new.